"You can't bomb us back into the Stone Age. We're already there. But you can start a new world war, and that's exactly what Osama bin Laden wants." I bought the new Dylan cd on Wednesday, in a state of shock and also in an attempt for relief. I bought the new Sparklehorse, whose beautiful cd was designed by our friend Dan. I bought Bjork last week. I haven't listened to any of these. Yet, it has now become time to take them out of their plastic sleeves. Time to turn off the tv and even NPR (after this current show) and listen to some music. For relief. For reprieve. Not that it's time to be relieved. Not that we don't need to feel our heartache and even our rage. We do. We will. But on Saturday evening, after watching the sunset over the East River through the smoky sky with our neighbors and our candles, Jenni and I were walking through the southside, towards our favorite restaurant/ comfort zone/ wine pourers. We heard son-style Cuban music blaring out of a fluorescent-lit social club. Metal folding chairs were set up inside, anticipating the buzz of the regular locals following their dinner hour. The music was celebratory, but not wrong. The voices were melancholy, full of heartache, but their singing lifted our hearts. We wanted to sit down inside, alone but for the proprietor. But our dining habits drew us further south, beyond the Williamsburg bridge. We clung to the music as it faded behind us, and it became clear that it was time to allow ourselves to escape into beautfiul music again. For some moments of beauty. For some moments. I thought the Muslim prayer that was read in the national prayer service in Washington DC yesterday was so beautiful. The translation was so poignant. Does anyone know where I can find a transcript of that? We went out on our street last night at 7pm, with candles. We joined our neighbors down the block, whom we hadn't ever spoken with before beyond playing with their children. We just joined them, they had a dozen candles they were lighting. It felt better to be in their group. They spoke mostly in Spanish and we don't understand, but they welcomed us. There are many children there. A talkative, small one kept speaking directly to us... really quite difficult to follow what she was saying... about the people who lived in the tall building, and the plane which exploded, she kept doing the universal explosion gesture, "pwqwquooooooohhh", with her voice and her tiny hands. We didn't know what to say. "Yeah", We said. We went on a walk around the block with our neighbors. A fifth grade boy, Ramondo, said "that was really a bad disaster, wasn't it?". We said "yeah, it was, wasn't it?". Our neighborhood, Williamsburg, Bklyn, was full of people walking with candles. Was yours? For a moment, during dinner with Paola, we forgot about the disaster. For about one moment. Then we watched Charlie Rose. You could be watching Charlie Rose, too. It is important television right now. Many people I've talked to, around the country, have been able to only clean. "I can't seem to do anything, but listen to the radio, and clean my house," said Paola on the phone. And Jenni. And my mom. and me. It's a time to purge unnecessary excess. It's never been easier to throw away that wine cork you've been saving but can't remember why; that NYTimes Magazine from 3 weeks ago you thought you'd get to reading someday, however, now there's so much other imporant stuff to read; i threw away that plastic sleeve that some stickers came in which I used up months ago. Why was I saving that? That entire dresser full of unworn clothes is going to some donation organization. Don't you really just wear the same 3 things over and over? I do. Observances: I saw the neighborhood prostitutes out on their corner on the night of the bombing (for those planes were bombs). I saw someone getting her hair cut and styled on Wednesday. People keeping on with normal activites in what is no longer normal life. Strangers are reaching out to one another, providing support and kindness. When Jenni and i were finally able to see eachother, we held one another for so long. But then we found ourselves not sure what to do with our lives, other than to appreciate being able to touch eachother. We went to find some food, and were served wine and pizza less than a mile from this bombing. It felt absurd, sitting in this restaurant, but also necessary to commune and go on living. The energy in the air is as never before, and things will never be the same. This is true in NYC and America and beyond. I've received emails from all over the world. Thoughts, prayers, and tales of discussion occurring on a global level, yet from one individual to another. I feel quite helpless. But I went to a yoga class which was very restorative, to feel a part of a support group. A NYTimes article on the mood here in our city. thanks. so much. to all who have called and emailed. words fail, and posting on this website feels quite insignificant. but we all feel the real need to reach out to loved ones and friends. 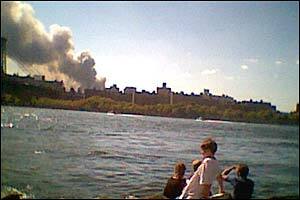 we went to the east river to watch the skyline formerly filled with the towers, now filled with smoke. i haven't had internet connection since tuesday morning. when i can i'll post this. just now feeling emotionally torn apart, nervous. terrified and heartbroken. 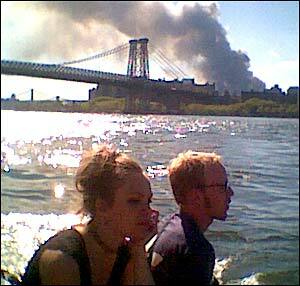 we saw the towers collapse, we saw so much with our plain eyes, but reality had yet to set in. still is difficult to comprehend. and to divorce ourselves from desensitization. we've seen so many computer generated disasters. we have learned to see things and to not believe them. it has taken some time to understand and comprehend the aftermath of this reality. I dont know. i have so much to talk about. we still only have one tv station here in bklyn, cbs channel two, which will only very rarely cut over to the network news, instead choosing to cover by the local team. understandable considering the hell hole in our home city. But they cut off President Clinton to instead cover a memorial moment in union square, which they'd been covering all day. i'm so frustrated. i need some other news source. BBC...CNN... something that will allow us to have a global perspective on this, a wider view on the tragedy and how it's effecting our nation beyond our local horrific reality: which is important to experience, but i feel that the rest of the nation is considering this on a global perspective, and i think we need that, too. an expansion on the reality. the local is so painful. Now that i have internet connection, i guess i can rely on websites, since 1-800-OK-CABLE phone line has been busy for 4 days. A CBS consultant was on air wednesday morning, and began reading a prediction by Nostradamus. It was referring to the ninth month, in the world's city, a city called York, fire and explosion, and smoke blowing at fourty five degrees, and the beginning of world war three, as well as the falling of two brothers... it was somewhat chilling, and then our local station cut him off. I've never been into prophecies, but it was eerie. And Freddie sent me this link on the correction of this urban-mythical exagerration. I find i believe so little now. we keep hearing things, which get corrected later. For now, clinging to NPR. "I seem to always sense a strong energy when i am around the towers, especially at night. it's nearly impossible to ignore. maybe it's their sheer size that makes me feel that way. or maybe not. perhaps those predictable (though powerfully hypnotic) patterns running over their facades are emitting something unique." Bkid has brought the local internet communities together. red's account is personal, heartbreaking and relieving. freddie has a comprehensive list of links for coverage, personal accounts, donations and resources. WORLD TRADE CENTER ATTACKED AND DESTROYED is the byline on our news. Just writing to say jenni and i are ok. robbie is here with me in brooklyn. he heard the radio this morning shortly after the first plane hit the WTC tower. we went on our roof. i watched thru binoculars as the second tower exploded in pluming orange fire. 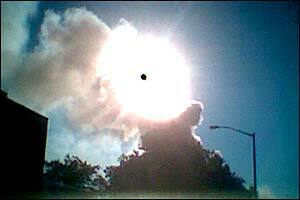 robbie saw the plane with his bare eyes as it dove into the building. i saw the orange flames fill my vision thru binoculars. the gray and black smoke is streaming south of here, in a straight line. we saw the first tower collapse. 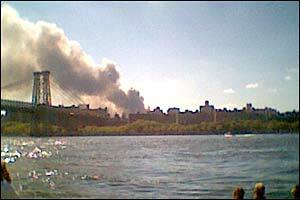 the second tower collapse. we just got back from the grocery store in williamsburg. there are masses of people heading there to buy foods. lionel richie was singing "tell me how to win your heart, cause i dont know what to do, let me start by saying, i love you", on radio speakers somewhere. streets were calm, but people were walking everywhere, also cars driving. a car almost ran over us on the way to the diner where we had some food and juice before we went shopping. as we walked thru the crosswalk, i tapped the window of the car as if to say "be careful of us". the car stopped. this woman in the back seat unrolled her window and very sarchastically said can "i help you?" she was so hostile. i said, Yes, just by asking your driver to be careful of pedestrians in crosswalks. it was the second car to almost run us over. you know what she said to me? she actually said : "We're going to war, Get a Life." how does someone say that? i spent the next hour walking, hating her, trying to forgive her but i hated her. i hated her for being so wrong and so inappropriate in the moment. we need love not hostility from our neighbors. at the grocery store people were trying to not feel like in a scene of a movie. couples and roommates shopping. buying rice. pasta. eggs. lots of people were buying meat. the bosc pears were all sold out. the tall stack of rice-bags was shrinking before our eyes. people buying garlic. nobody was freaking out. we were all unsure of how to behave appropriately, other than to sensibly shop. all of us still not knowing if this is overdoing it or underreacting. lots of people bought potato chips. we bought brownie ice cream. pasta. rice. lots of fresh fruit. soy milk. cereal. just to be sure. I found out Red is okay, he works down near the disaster. i know a man named Frank DiMartini, who lived behind me in Ft.Greene, bklyn and almost bought john's car from me. He was the manager of the office of the building management of the World Trade Center. I'm wondering about him. We just photographed the World trade center's twin towers on sunday at sunset. its eerie... weren't we just on the roof a couple months ago, facing the other direction with our binoculars watching Brooklyn's twin silos imploded intentionally, as they poofed and collapsed to the ground. its absurd. the two round squat towers, flimsy smoke, flattened and are gone from our skyline leaving a void in our horizon. now the void of magnified unspeakable proportion in the opposite direction facing manhattan's lower end. and it's my dad's birthday today. it's not just happening here, of course it's happening to the country and the world. but being here while this is happening is horrific. i'm shaking and sick. everyone's sick and speechless.